Dry-Treat™ is the world leader in impregnating sealer technology. Dry-Treat™ impregnating sealers provide premium protection for natural stone, tiles, paving, brick, concrete and grout. Dry-Treat’s unique impregnating sealers penetrate much deeper and bond permanently without affecting the look or breathability of the treated surface. Dry-Treat impregnating sealers are suitable for a wide range of applications, including countertops, patios and other entertainment areas, cladding, paving, kitchens and pool surrounds. Dry-Treat’s superior penetration and permanency creates a deep water and oil repellent barrier. 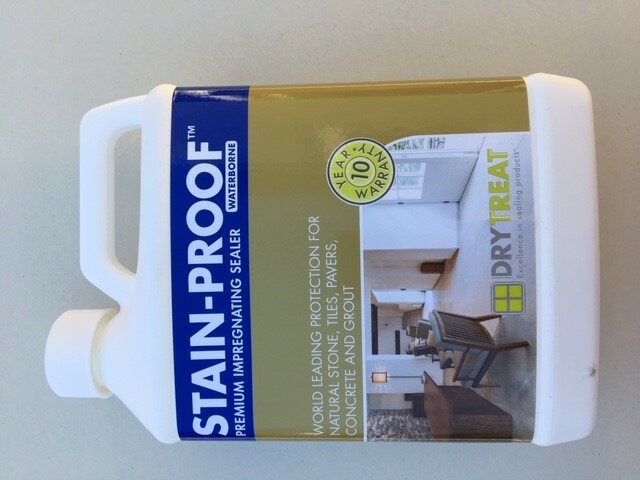 The Dry-Treat™ barrier provides premium stain protection, but, unlike other penetrating sealers, also protects many other common types of damage, including salt efflorescence, spalling, freeze-thaw damage and picture framing. Dry-Treat™ impregnating sealers stand up to cleaning chemicals, traffic, sunlight, and even commercial cleaning techniques such as high pressure washing. Dry-Treat™ sealers are backed with written performance warranties of up to 15 years, when the sealers are applied by a Dry-Treat™ Accredited Applicator. STAIN-PROOF WATERBORNE™ offers premium water and oil stain protection in a water-based formulation. Protection against efflorescence, salt damage. Treated surfaces are easier to clean. Retains breathability ,existing color and finish. For indoor, outdoor, residential and commercial use on porous hard surfaces including natural stone, tile, pavers, masonry, concrete and grout. 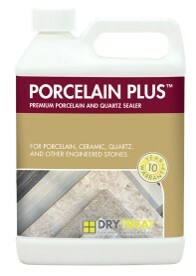 PREMIUM SEALER FOR PORCELAIN AND QUARTZ PORCELAIN PLUSTM is a premium, impregnating sealer specifically designed for porcelain and quartz surfaces. PORCELAIN PLUSTM features nano size sealing molecules that will seal the micro pores in polished porcelains and quartz surfaces. This new technology has been developed specifically for surfaces with low absorption rates in an easy to use, non-film forming sealer.